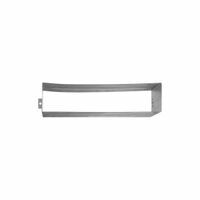 Wall mount mailbox is constructed of a durable polypropylene. Weather and rust resistant. Front panel has a classic decorative engraved design. Comes fully assembled. Size: 7.9"H x 15.5"W x 4.7"D. Smooth rust resistant galvanized steel mailbox comes fully assembled with steel latch and aluminum flag. Medium capacity is standard in most households and can hold letters, magazines, padded mailers and small boxes. Size: 8.9"H x 6.9"W 20.1"D. Smooth rust resistant galvanized steel mailbox comes fully assembled with steel latch and aluminum flag. Medium capacity is standard in most households and can hold letters, magazines, padded mailers and small boxes. Size: 8.9"H x 6.9"W 20.1"D.
Rustproof polypropylene plastic resists impacts and all types of weather while providing outstanding service. The mailbox body incorporates a ribbed design on top and textured side panels. Medium size holds magazines, padded mailers and small boxes. Comes fully assembled. Size: 9.8" H x 7.9" W x 20.4" D. Flap and back plate included. Size: 10"W. Rustproof polypropylene plastic construction provides durability while the ribbed body adds strength. Incoming mail flag notifies homeowners of deliveries. Wide, large opening easily holds small packages along with daily mail. Size: 9.5"H x 12.4"W x 21.3"D.
Standard post. Grade #1 Southern Yellow Pine. Prowood Micro CA mold inhibitor. Pre-assembled for easy set-up. 4" x 4" wood construction. Size: 72"H x 4"W x 4"D. Medium wall mount mailbox is constructed of heavy-duty galvanized steel with a textured finish. Fully assembled. Mounting hardware sold separately. Size: 9.8" H x 16.6" W x 4.5" D. Medium wall mount mailbox is constructed of heavy-duty galvanized steel with a textured finish. Fully assembled. Mounting hardware sold separately. Size: 9.8" H x 16.6" W x 4.5" D.